In the overhead (triceps) press the triceps brachii muscle is involved in elbow joint extension. In this action the forearm moves away from the upper arm, which is held stable, to a fairly straight, upright, arm position. Elbow joint extension and the muscles involved are very important in execution of many sports skills. For example, they are needed in many overhead hitting actions such as the tennis serve and smash and basketball shooting. Elbow joint extension is a key action in pushing and throwing actions as used in the shot put, pressing up into a handstand in gymnastics, in hand-to-hand balancing, pushing an opponent in football, jabbing in boxing, various actions in mixed martial arts, in some baseball pitches and so on. It is important to keep your elbows pointed straight up. If they drop down in front, it will weaken the action of the triceps tremendously because the weight will no longer produce effective resistance, that is, be lifted directly against gravity. It also makes execution more difficult but not effective. For maximal development, it is not always necessary to fully extend your arms. When your arms are bent at a 90-degree angle, the triceps is strongest. Thus, after you pass the 90-degree range, the triceps is no longer strongly involved. 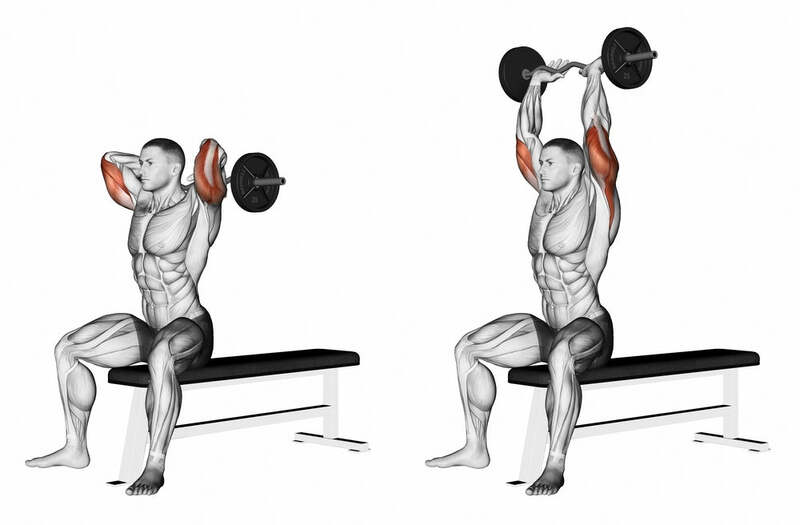 Also, if you fully extend your arms when using heavy weights, there will be more compression forces on the elbow joint especially if you lock out. KinX Learning is a digital content company that creates digital products in the kinesiology of exercise. All our content is based on the work of Dr. Michael Yessis, sports training specialist. © 2019 KinX Learning. All rights reserved.